When we’re wrapping our heads around a new way of eating, such as a grain free lifestyle, much brain power goes towards “What can I eat now that other foods are off limits?” It often leaves a small portion of mental energy devoted to creating colorful, varied meals. As a result, I frequently hear that people get bored with paleo. 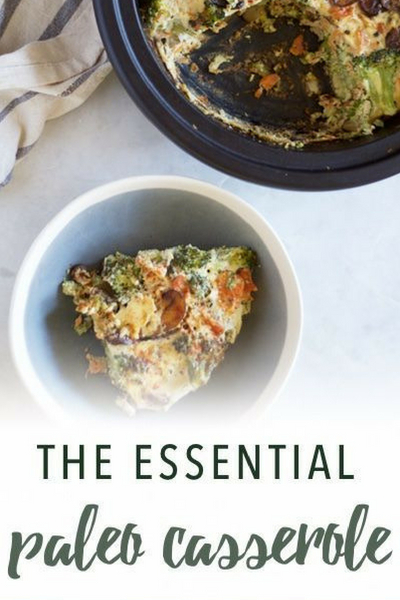 “I’m tired of grilled meat and sauteéd veggies, but I don’t know what else to eat.” This recipe, simple in preparation and minimalist in presentation, provides a flavorful solution to boring meat and veggies. If you’re looking for a make-ahead meal for work or school lunches, you’ll love this. It’s travel friendly, and delicious without re-heating. Paleo mayonnaise — Traditional casseroles contain cheese, but this recipe relies on mayo to provide richness and creaminess. Because most mayonnaise contains inflammation-perpetuating vegetable oil (corn, canola, safflower or soy), use a homemade version or an avocado oil mayo. I highly recommend Primal Mayo, and I worked with Thrive Market to offer you a free jar of the mayo here. Coconut milk — Coconut milk add creaminess to the base of the casserole. It’s essential to use canned coconut milk, not the rather pathetic and watery coconut milk found in cartons. Eggs — Eggs combine with the mayo and coconut milk to create the binder. If you know me, you already know what I’m going to say next… egg substitutes will not work in this recipe. 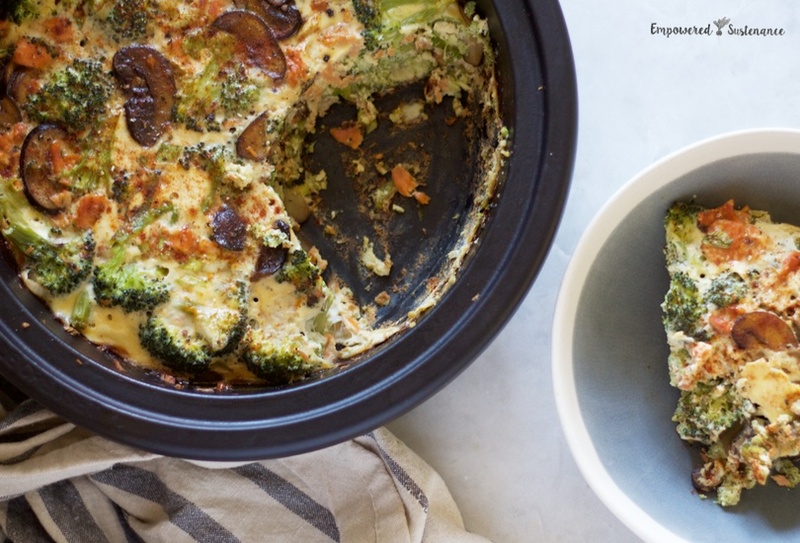 Canned wild salmon — I use Wild Planet canned salmon as the primary protein in this paleo casserole, but feel free to use whatever protein you have on hand. I’ve substituted shredded rotisserie chicken, and one time I used bacon crumbles for an almost rapturous result. Preheat the oven to 350 and have ready a small (8x8) casserole dish. Bring a pot of water to a boil, add a big pinch of salt, and boil the broccoli until just tender but still slightly crisp. Drain and set aside. Meanwhile, heat the oil in a saute pan over medium heat. Add the mushrooms and don't stir for a minute or two, until fragrant and golden on one side. Then stir and saute until tender. In a bowl, whisk together the eggs, mayo, coconut milk, a pinch of salt, and some pepper. 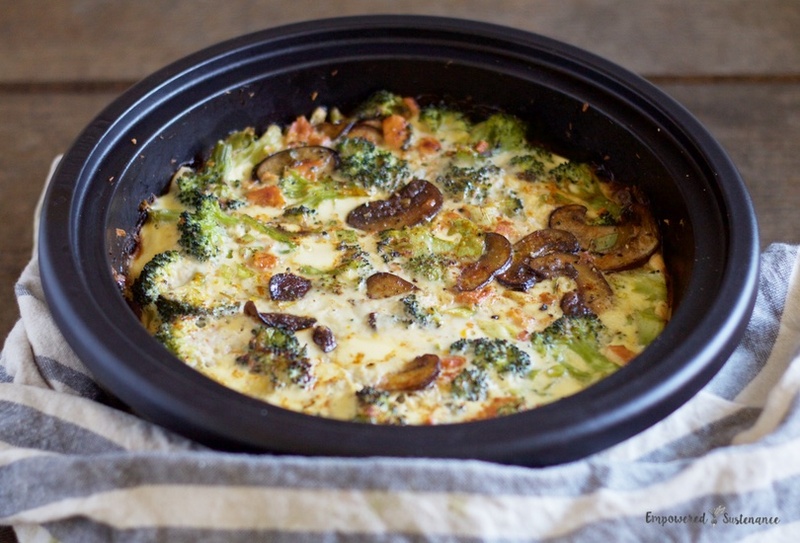 In the casserole dish, combine the broccoli, mushrooms, salmon, and green onions. Spread evenly in a dish. Pour the egg mixture evenly over the veggie mixture, and press down the veggies into the eggs. Sprinkle with smoked paprika. Bake for 40 minutes, until set. Cool for 10 minutes before enjoying. Leftovers keep well in the fridge for a few days. As indicated above, feel free to substitute shredded chicken for the salmon. Alternatively, you can use cooked, crumbled sausage or ground meat. You can also double the recipe and use a 9x13 casserole dish. This is a fantastic recipe, thank you so much for your generously sharing your experience and recipes and all the helpful info on alternative treatments! I thought I had broccoli in the freezer, but didn’t (typical of me), but I did have Brussels sprouts and cauliflower, so I used 2 small bags of Brussels sprouts and 1 of cauliflower, and cut them into small slices after they were cooked. My husband and I both enjoyed the result and I will make this dish again, and we’ll try it with the broccoli. Keep up your good work! Much appreciated!